This Along the Garden Path tapestry shows the work of artist Alix Stefan. Born in Winsconsin, growing up in Puerto Rico, then returning to New York and later to Tucson Arizona, Stefan's art shows a magnificent love of nature. Her works have appeared all over the world. Here we see a meandering garden path through shrubs and flowers of whites, pinks, reds and yellows. The path is lit and leads towards a green grasses area and a wisp of violet to denote distance. A decorate border completes the work. 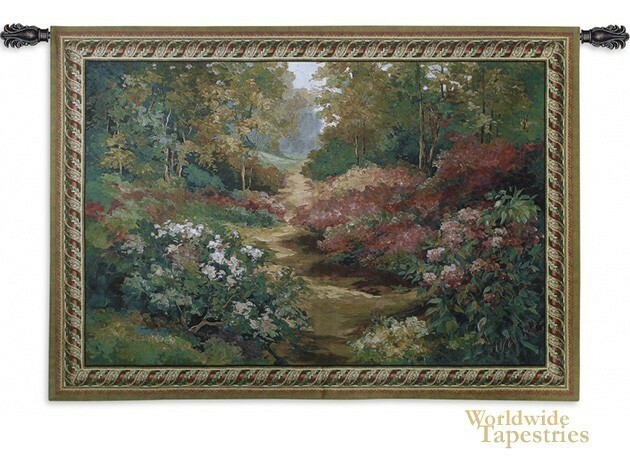 This Along the Garden Path tapestry is backed with lining and tunnel for easy hanging. Note: tapestry rod and tassels, where pictured, are not included in the price. Dimensions: W 53" x H 43"
Dimensions: W 68" x H 53"